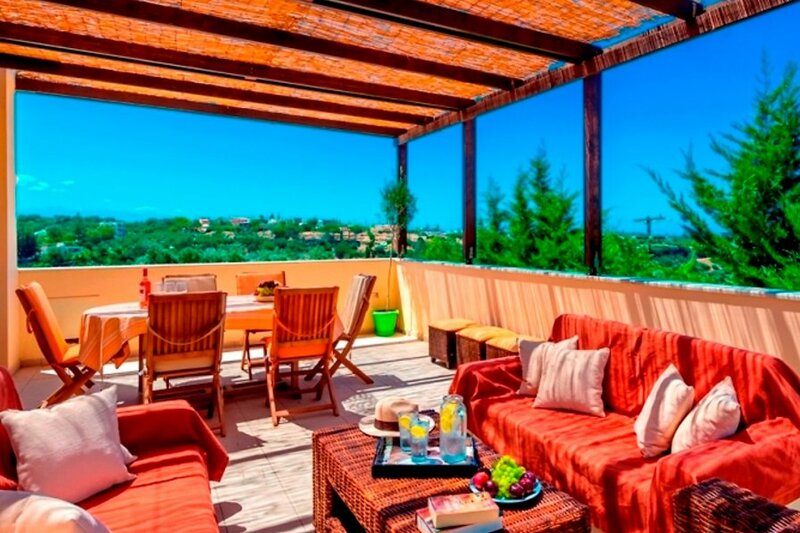 This 3-bedroom villa for up to 6 guests is located in Asteri and has a private swimming pool. Asteri 15 km from Rethymno: Very modern, comfortable villa Citrus, terraced, built in 2009, surrounded by trees. In the centre of Asteri village, in a sunny position, 2 km from the beach. Private: property 500 m2 (fenced), flowers and trees, courtyard, swimming pool with privacy (35 m2, 01.05.-31.10.). Outdoor shower, whirlpool, terrace, barbecue. In the house: with TV, WiFi, central heating system, air conditioning, washing machine. Linen change 2 times per week. Towel change 2 times per week. Parking. Shop 100 m, grocery 3 km, supermarket 3 km, shopping centre 15 km, restaurant 100 m, bar 3 km, bakery 3 km, cafe 100 m, internet cafe 3 km, sandy beach 3 km. Please note: car recommended. Suitable for families, suitable for seniors.